Мusic production requires a lot more than just pure skill. Just like any other profession out there, having the right tools for the job is essential. However, things get complicated when you try to get those tools on a budget. Thankfully, there are still some options on the table. 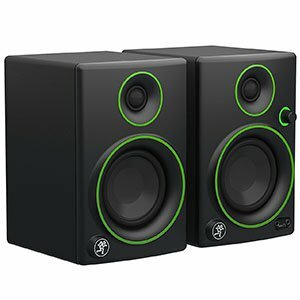 Today we are going to show you top 3 best monitor speakers under $100. These may not be the best monitors out there but they will get the job done and allow you to pursue your passion of creating music. With that in mind, let’s get right into the matter. Finding a good set of affordable speakers used to be extremely hard. While the situation isn’t significantly better these days, we have seen a number of improvements. One such improvement are models like Sterling Audio MX3. These speakers are the very definition of bang for your buck. Compact, well made and rather powerful, MX3 deliver a very impressive performance at an affordable price. You are looking at a 20 Watt setup comprised of a 3/4″ silk dome tweeter paired with a 3″ low frequency transducer. What makes MX3 real interesting is the fact that both speakers are bi-amped and run off of a Class A/B unit. In terms of performance and transparency, Sterling Audio MX3 offer a decent experience especially for beginner producers. Akai isn’t necessarily known for their studio monitors as much as they are known for other music related equipment. However, they have proven to be more than capable of nailing the essence of budget studio monitors. 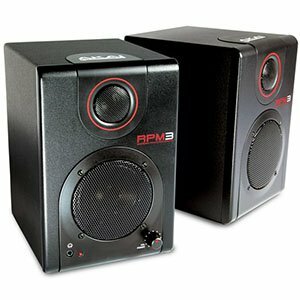 The best example of that are their Professional RPM3 compact monitors. Akai has put together a package that not only works, but works rather well. Each speaker features a 3″ low frequency driver paired with a 1″ tweeter. Both transducers sit behind a metal grille, which both protects them and gives them a more interesting look. In terms of frequency response, you’re looking at 80Hz to 20kHz, which is more than sufficient in this particular segment of the market. With front facing controls, PRM3 are great for every day use. Budget monitor speakers are a category where we get to see some pretty convenient designs. Edifier R1010BT is one such set of speakers. Not only do they look like something that should be at least twice as expensive, but they also bring some interesting features. 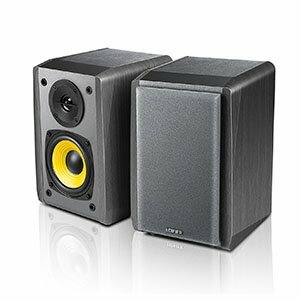 Despite their stylish and somewhat retro appearance, Edifier R1010BT are proper studio monitors. Best of all, they are super compact. Each speaker comes with a 3/4″ tweeter paired with a 4″ low frequency driver. Combined, you are looking at some 24 Watts RMS, which makes them more powerful than many of their competition. What really sets R1010BT apart from the rest is the fact that these come with built in Bluetooth support. That pushes the convenience factor pretty high. 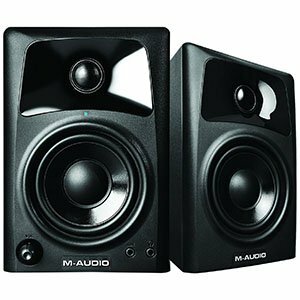 It is no secret that M-Audio’s AV32 have been the go to choice for many beginner producers around the world. Even though these speakers have come out some time ago, that fact hasn’t changed. There is a pretty good reason for this as well. M-Audio has found a great combination of price and performance with AV32. They are the type of package that just works. Each speaker packs a 1″ ferrofluid-cooled silk dome tweeter and a 3″ woofer. In terms of power, you’re looking at 10 Watts per channel, making these a 20 Watt package. M-Audio spiced the deal up even further with their smart cabinet design as well as the advanced wave guide design for the tweeter. When it comes to compact desktop monitors, these are near the top. Compact desktop monitors are nothing new, but finding a pair that is versatile as well as affordable isn’t easy. Samson MediaOne BT3 solve this issue quite nicely. You are looking at a pair of quite stylish speakers which not only work well but also look quite nice. The design itself is a breath of fresh air in the sea of black plastic. When it comes to hardware and performance, we have a 1″ silk dome tweeter paired with a 3″ low frequency woofer. 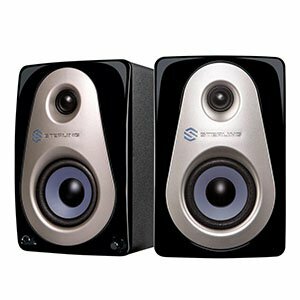 Each speaker is capable of pushing 15 Watts RMS, making these one of the most powerful monitors you can get in this particular price range. On top of that, there is also Bluetooth support, front facing controls and a great I/O cluster. 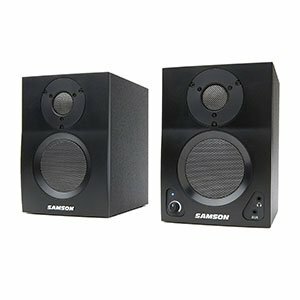 Trying to find a set of speakers which can be used as monitors but also general purpose speakers is hard. Alesis M1 Active 320 USB is among the few models out there which fit this description. These are compact in nature, feature a rather subtle design and hide a few interesting features. Needless to say, Alesis M1 is a great choice for desktop use. What Alesis M1 Active 320 USB particularly interesting is the fact that they feature a USB port in addition to the regular I/O. On top of that, you get a bass boost feature which effectively gives these speakers a bit of depth in the low range. Just by pressing that bass boost button you can go from pure monitors to general purpose speakers. If there is one set of affordable speakers everyone knows about, it is the Mackie CR3. Overall, CR3 and the rest of the CR series have proven to be a perfect solution for those just getting into music production. They feature well balanced components combined with stylish design and a rather reasonable price. In terms of size, these fall under the compact category. Each speaker packs a 1″ tweeter paired with a 3″ low frequency driver. Supported frequency range spans from 80Hz to 20kHz, which puts Mackie CR3 among the more realistic budget monitors. The sound quality is more than decent for a build like this, while there is also a surprising amount of transparency. Most importantly, Mackie CR3 push 50 watts of power divided between two channels. 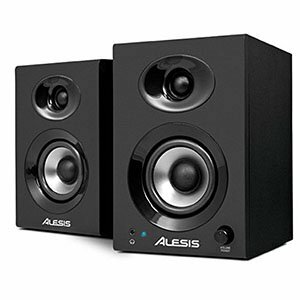 Alesis is among those few brands which dominate the budget segment of the studio monitor market. Their Elevate 3 monitors are pretty straight forward, which is what their users tend to appreciate the most. We are looking at all black cabs with simple baffles ad overall subtle aesthetics. The whole idea behind Alesis Elevate 3 is to get you the performance you need. They didn’t really focus too much on anything that didn’t contribute to that effort. In terms of hardware, we have a 1″ dome tweeter paired with a 3″ low frequency driver. Combined, both cabs push out some 60 Watts of rather transparent sound. Add to that a fairly accurate frequency response range that goes from 80Hz to 20kHz and you have a great setup. What Can You Expect From $100 Monitor Speakers? The main difference between monitor speakers and regular speakers is in the way they render tone. Your standard computer speakers will be bass heavy, with a tone profile aimed at giving you most flavor out of your music. That is not the case with monitors. Their main purpose is to be as flat as possible, thus showing you the raw sound of your mix. Achieving that kind of transparency with $100 monitor speakers is hard. A set that is somewhere in the $500 range will do a far better job. The problem with affordable monitors starts with the size of the transducers. In most cases out there, there will be a driver and a tweeter in each cabinet. Some brands like to label these drivers as woofers, but that is wishful thinking at best. You are looking at 3″ inch units which have their limits. Best case scenario, it is going to be a decent full-range driver that reaches low enough and has a linear frequency response across the range. Worst case scenario, you are going to deal with a dead low end and a reasonable middle department. A more expensive set of monitors, in $1000 price range or similar, will give you perfect clarity and response from the lowest to the highest portions of the frequency range. As you have probably figured out by now, you get what you pay for. This is undoubtedly a budget option, but it delivers that most important factor about any low-cost item – it’s actually useful and not just something to play around with, and it delivers a top bang for the buck. Anyhow, let’s get on with the article! Understanding these limitations is extremely important unless you want to end up disappointed. Then next logical question is whether or not you can use a configuration such as the one we have just described. The answer to this question will depend on your ability to recognize imperfections in your mix, as well as your overall skill. Those who are experienced in mastering and mixing music will probably need a more sensitive set of monitors. On the other hand, beginners who are not sure whether or not they will be doing music production a few years down the line will be covered by an affordable set. Some will say that getting a cheap set of monitors is a mistake. We respectfully disagree. 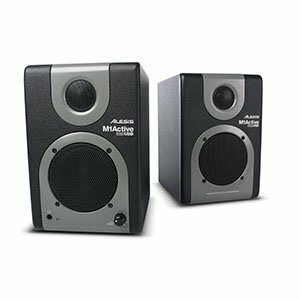 Any kind of monitor speaker is better than a general purpose set if you are thinking about doing music production. Despite budget monitors being fairly narrow when it comes to features, they still come in a variety of different shapes and forms. Figuring out which one to go with can save you a whole lot of trouble down the road. First of all, you shouldn’t really bother yourself too much with choosing your first monitors, especially if they are within the price range we are discussing today. As contradicting as we have made ourselves sound there, the point is that you should allow yourself some leeway in this whole process.These are going to be your first monitors, but definitely not your last. As a matter of fact, chances are that you will require something more serious within the first year or two of becoming a producer. Because of all that, don’t disregard hybrid monitors or those which feature Bluetooth technology. Too many newcomers go for the bare bones setup that is devoid of any kind of features. Those models are designed for people who are going to use monitor speakers for a very strict application. If these are supposed to be your only speakers for a while, a good hybrid might do you more good. Most budget monitors are going to come with a 3″ or 4″ inch low frequency drivers. Expecting anything more than that will leave you disappointed. For the most part, that extra inch of transducer real estate won’t necessarily make a difference in performance. The truth is that most of these transducers fall within the mid range driver territory, or even full range sometimes. Both 3″ or 4″ drivers will work, especially in smaller studios. As a matter of fact, smaller drivers are much more preferable when you are working in confined spaces. Getting the optimal performance from your speakers is going to depend much more o how you position them. The question of power is a bit more interesting. Most of the budget speakers are going to be within the 20 to 50 Watt range. Anything in in that spectrum is going to be plenty enough for comfortable music production. However, aiming for a higher power rating can provide you with additional head space when you start mixing your projects. Monitor speakers listed in this guide are by far some of the best you can get for $100 or less. We’ve searched for performance above anything else, trying to find decent speakers that could be viable in a home studio setting. Once more, it’s important to understand the limitations of monitors in this price range. You won’t get perfect clarity nor transparency, but the performance these speakers have to offer is more than enough to get started. It is always recommended to get the best gear your money can buy, even if a $100 set is all you can afford.